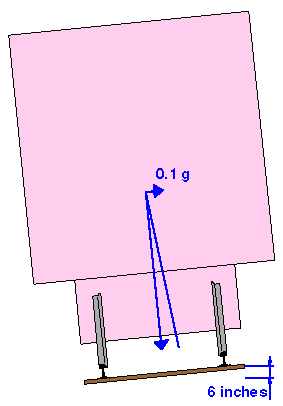 The superelevation of the track, describing the height difference between left and right rail. The unbalanced superelevation allowed by the railroad administration. This allowance is either given in general, or for a certain type of train. "Unbalanced superelevation" describes an acceleration. Instead of the usual ways to do that, the lateral acceleration to the outside of a curve is expressed by the amount of superelevation, that would be necessary to reach a balanced condition. The first example shows perfectly superelevated track. The acceleration towards the outside of the curve is completely balanced by the superelevation, so the train can glide through the curve, without any forces felt by the passenger. The second example shows the same curve radius and the same speed, but the track isn't superelevated. 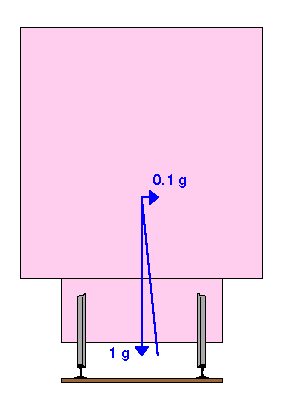 Passengers are accelerated by 0.1 g towards the outside of the curve. 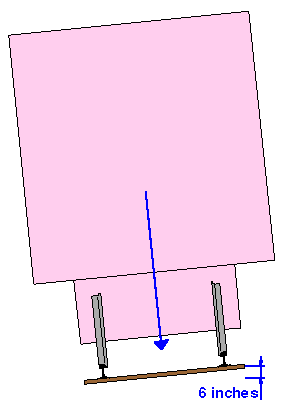 As can be seen in the first example, 6 inches of superelevation would bring the train into a balanced condition. If the train goes faster than 39 mph in the 1000 feet radius curve, there is unbalanced superelevation added again. 55 mph would need 12 inches of superelevation, but that's not allowed. These 12 inches can be replaced by 6 inches of actual superelevation plus 6 inches of unbalanced superelevation. If the value of unbalanced superelevation gets very high, a tilting system is needed to assure passenger comfort. But the existence of a tilting system does not make the train any faster. To operate faster, the allowed value for unbalanced superelevation needs to be raised. The value depends on center of gravity, on axleload, on the quality of wheel/axle construction, on tracking ability, on track quality, and on the policy of the administration. If all math is done by computers, the usefulness of calculation shortcuts like "unbalanced superelevation" declines, and some railroads have begun to use standard metric acceleration figures instead. Within this article, conversion to that figure will be added in the page footer.